Wether it is challenging an individual or a public transit company, the key to our success is building an air tight case based on facts, a thorough investigation and expert opinions supporting our findings. We meticulously prepare our cases and fight passionately to ensure our clients are justly compensated and can move on knowing that their rights were protected and justice was properly served. Motor vehicle accidents occur daily, resulting in various injuries and often even death. While some accidents are caused by unfortunate conditions outside of anyone’s control, quite often they are a result of someone’s negligence or even deliberate actions. While actions such cell phone use during driving, drunk driving, and dangerous driving can result in substantial fines, a criminal record and license suspensions, they are still ongoing and a major cause for accidents resulting in serious injuries. Off the roads, serious accidents can occur on boats, ATVs, motorcycles and snowmobiles. Insurance adjusters will often try to discount these long term injuries and in many cases very severe effects of a motor vehicle accident. 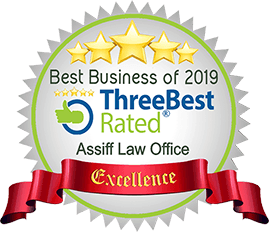 At Assiff Law we are committed to guiding you towards the best path to recovery and to the very best experts in the industry, that will not only help you towards your recovery, but also give a truthful, accurate and comprehensive evaluation of your injuries and their long term effect. Our experienced personal injury lawyers can help you deal with the situation and understand your rights. Assiff Law is here to answer all your questions and help you get the compensation you deserve. If you have suffered injuries in a car accident due to someone else’s negligence, you need an experienced car accident lawyer at your side. With over 20 years of personal injury litigation experience, specializing in car accidents, Assiff Law offers representations to anyone in Edmonton Alberta. We offer a flexible schedule and a free consultation to get you started. Our top priority is to give you the fair compensation that you deserve. Upon our free consultation we will assess your case and will estimate your chances of winning. If you decide to hire Assiff Law, there will be no fee until you collect. Please do not hesitate to get in touch with Assiff Law, Alberta’s leading Car Accident Lawyers, today for your free consultation.